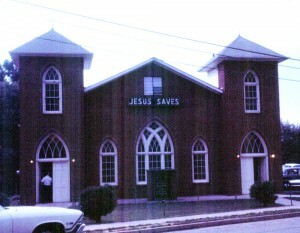 What is now known as the West Court Street Missionary Baptist Church had a humble beginning. In the Spring of 1939, Evangelist Herman Martin began a tent revival where the present church is located today. Services were held in the tent until the latter part of 1940. In need of a better place to worship, the tent congregation erected a wooden building, calling it the “People’s Gospel Tabernacle”. This building was very crude; with handmade benches, shavings from a nearby sawmill on the ground and two coal burning stoves for heating. Worship services were held on Sunday afternoon to not interfere with services at surrounding churches. The people that attended the tabernacle loved God and each other. They had a great desire to have a better place to worship and to have an organized church; so it was decided that a cement block building would be erected. The work began on building the church in 1943. On February 9, 1947, the congregation voted to become an organized church and voted to change the name of the “People’s Gospel Tabernacle” to “West Court Street Missionary Baptist Church”. The first pastor of the church was Rev. Julius H. Henline. Rev. Henline and his wife, Cordia, served the church until mid-1950. In August 1950, Rev. Ray Long was elected as the next Pastor. The church grew under Rev. Long’s ministry. Rev. Long and his wife, Estelle, served the church until 1962. Rev. Billy Bryant received a call from West Court in November of 1962. He assumed his duties as Pastor in January 1963. Rev. Bryant and his wife, Bonnie, faithfully served the church for 37 years until November 1999. The church grew and prospered with the building of a new sanctuary and fellowship building under the guidance of Preacher Bill. In November, 1999, the church voted Rev. Reid Cooper as Pastor. Rev. Cooper and his wife, Jolene, served the church until 2004. On March, 2004, the church call Rev. Ross Lewis as Pastor. We are blessed to have Rev. Lewis and his wife Brenda with us still today. We are thankful for God’s blessings upon West Court Street Baptist Church; for all the souls saved, lives changed and the strength that is given to each and every one that is part of the church family. More than sixty-five glorious years – of serving God, singing, shouting, Holy Ghost preaching and rejoicing as – HE IS ALTOGETHER LOVELY!